PA chairman meets Kerry and French counterpart in Paris, says any reboot of peace talks with Israel should happen within a clear timeframe. Palestinian Authority (PA) chairman Mahmoud Abbas on Saturday said that any reboot of peace talks with Israel should happen within a clear timeframe and under international supervision. Abbas made the comments after his meeting with U.S. Secretary of State John Kerry in Paris, reported the AFP news agency. Abbas also held talks with French Foreign Minister Jean-Marc Ayrault on the prospects of achieving a two-state solution, senior Palestinian official Saeb Erekat said, describing both discussions as "very constructive". "We need a timeline for the negotiations, we need a timeline for the implementation, and we need an international framework that will ensure the implementation of any agreement reached," Erakat was quoted as having told reporters. 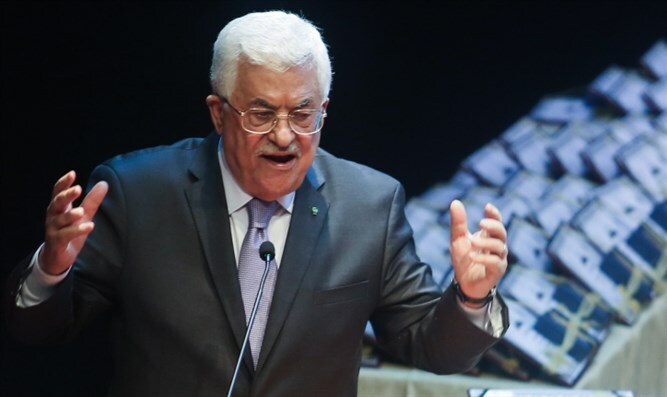 Abbas's meetings in France come amid renewed global efforts to renew the stalled peace process. France is at the center of those efforts, having in June convened a Paris meeting of world powers – without Israel or the Palestinians – to work toward organizing an international conference to reboot talks by the end of the year. Prime Minister Binyamin Netanyahu has dismissed the French initiative entirely, saying he only way to achieve peace is through direct talks with the PA.
Abbas, for his part, has welcomed the move and just recently urged the African Union member states and its officials to support it. On Saturday, the PA chairman "reiterated our full support to the French initiative that aims to convene an international conference before the end of the year," Erekat said, according to AFP. The Palestinian negotiator added that there was "no contradiction" between the French, U.S. and more recently Egyptian efforts to break the deadlock and move the peace talks forward. The diplomatic initiatives showed that the "status quo can't be sustained", he added, calling on Israel to "stop all settlement activities" in order to give "credibility to any peace process". "They agreed that strong leadership was required by all parties to help reduce the violence and take practical steps that can lead to meaningful discussions," the State Department said in a statement.